White Castle Vineyard01873 821443work VineyardWhite Castle Vineyard is owned by Robb & Nicola Merchant, it is situated in the beautiful rolling countryside of Monmouthshire in the village of Llanvetherine close to the towns of Abergavenny and Monmouth. The 5 acre vineyard is planted on a gentle south facing slope that is ideal for growing vines and ripening grapes for Welsh wine. White Castle Vineyard is dedicated to producing a variety of quality welsh wines using first class viticultural practices. Visitors are warmly invited to visit White castle Vineyard to experience the beauty and tranquillity of our rural setting. We have our first vintage 2011 award winning quality welsh wines available for purchase from the Cellar Door. 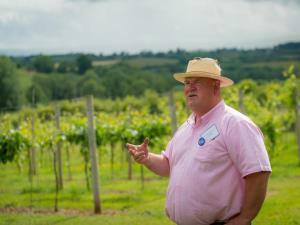 White Castle Vineyard is owned by Robb & Nicola Merchant, it is situated in the beautiful rolling countryside of Monmouthshire in the village of Llanvetherine close to the towns of Abergavenny and Monmouth. Cellar Door open Saturday & Sunday 10am -4pm for Wine purchases and Gifts.